When traders start mastering OpenCL, they are confronted with the question of where to apply it. Such illustrative examples as multiplication of matrices or sorting large amounts of data are not widely used in the development of indicators or automated trading systems. Another common application — working with neural networks — requires certain knowledge in the area. Studying neural networks can cost a lot of time for a common programmer without guaranteeing any results in trading. This circumstance may turn down those who would like to feel the full power of OpenCL when solving elementary tasks. In this article we will consider the use of OpenCL for solving the simplest task of algorithmic trading — finding candlestick patterns and testing them on history. We will develop the algorithm of testing a single pass and optimizing two parameters in the "1 minute OHLC" trading mode. After that, we will compare the performance of the built-in strategy tester with the OpenCL one and find out which of them (and to what degree) is faster. It is assumed that the reader is already familiar with OpenCL basics. Otherwise, I recommend reading the articles "OpenCL: The bridge to parallel worlds" and "OpenCL: From naive towards more insightful programming". It would also be good to have the OpenCL Specification Version 1.2 on hand. The article will focus on the algorithm of building a tester without dwelling on OpenCL programming basics. We need to rely on something to make sure that the implementation of the tester on OpenCL works correctly. First, we will develop an MQL5 EA. Then we will compare its results of testing and optimizing using a regular tester with the ones obtained by the OpenCL tester. 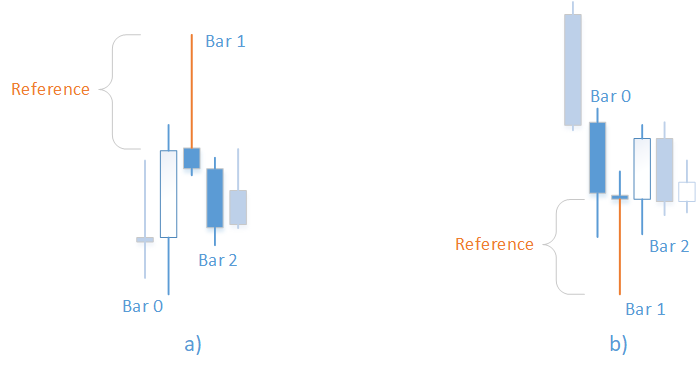 The test object is a simple EA trading the following candlestick patterns. The presence of the pattern is to be checked on fully closed bars. In other words, we search for a pattern on three previous bars as soon as a new one appears. Pattern definition code is provided below. For trading, we will use the CTrade class from the standard library. To define the tester speed, we will use the CDuration class that allows measuring time intervals between control points of the program execution in microseconds and display them in a convenient form. In this case, we will measure the time between the OnInit() and OnDeinit() functions. The full class code is contained in the attached Duration.mqh file. The EA work is extremely simple and consists of the following. First of all, launch optimization to find out the best input values for the EA to trade profitably or at least open positions. We will optimize two parameters — a reference value for patterns and Stop Loss level in points. Set Take Profit level to 50 points and select all patterns for testing. Optimization is to be performed on EURUSD M5. Time interval: 01.01.2018 — 01.10.2018. Fast optimization (genetic algorithm), trading mode: "1 minute OHLC". As we can see, the best result with the profit of 1000.50 was received with a reference value of 60 points and on Stop Loss level of 350 points. Launch testing with these parameters and pay attention to its execution time. Remember these values and proceed to testing the same strategy without involving a regular tester. Let's develop a custom tester using OpenCL features. As we can see, the class contains a pointer to the COpenCL object, as well as several methods used as wrappers for the COpenCL class methods of the same name. Each of these methods has the name of the function and the string it was called from among the arguments. In addition, enumerators are used instead of kernel indices and buffers. This is done to enable applying EnumToString() in the error message, which is much more informative than just an index. Let's consider one of these methods in more detail. There are four such macros in total. Let's consider them one by one. It differs in that the function name and string are passed as parameters. Why was this done? Suppose that an error has occurred in the KernelCreate() method. When using the SET_ERR macro, we can see the KernelCreate() method name, but it is much more useful to know where the method has been called from. To achieve this, we pass the function and the method call string as arguments inserting them to the macro. In the macro, an error code is passed as a parameter rather than calling GetLastError(). In other aspects, it is similar to the SET_ERR macro. Apart from checking the presence of the COpenCL class object and operation result, it also contains the function for accounting and checking free memory. Since we deal with relatively large amounts of memory (hundreds of megabytes), we need to control the process of its consumption. This task is assigned to СMemsize. The complete code is contained in the Memsize.mqh file. Most of these macros end in return false, while _KernelCreate ends in break. This should be considered when developing the code. All macros are defined in the OCLDefines.mqh file. The mode argument sets the initialization mode. This may be optimization or single testing. Various kernels are created based on this. Kernel and buffer enumerators are declared in the OCLInc.mqh file. The kernels' source codes are attached as a resource there, like the cl_tester string. Now that all the conveniences have been developed, it is time to start the main work. We already have a relatively compact code and comprehensive information about errors. But first we need to upload data we are to work with. This is not as easy as it might seem at first glance. The CBuffering class uploads the data. We will not dwell on it too much, since data upload has no direct relation to the current topic. Anyway, we should consider its application briefly. The class contains the Open, High, Low, Close, Time and Spread buffers. You can work with them after the Copy() method has successfully worked out. Please note that the Spread buffer is of 'double' type and is expressed not in points, but in price difference. Besides, copying the Spread buffer is initially disabled. If necessary, it should be enabled using the SpreadBufEnable() method. The Copy() method is used for upload. The preset point argument is used only to recalculate the spread from points into price difference. If the spread copying is off, this argument is not used. Inability to download data in the amount exceeding TERMINAL_MAXBARS using the CopyTime() function and the like. No guarantee that the terminal has the data locally. The CBuffering class is able to copy large volumes of data exceeding TERMINAL_MAXBARS, as well as initiate the upload of missing data from the server and wait for it to finish. Due to this waiting, we need to pay attention to the SetTimeout() method meant for setting the maximum data upload time (including waiting) in milliseconds. By default, the class constructor is equal to 5000 (5 seconds). Setting timeout to zero disables it. This is highly undesirable, but in some cases it may be useful. There are some limitations though: M1 period data are not uploaded for the period exceeding one year, which to some extent narrows the range of our tester. So the data have been downloaded. Now it is time to implement the test algorithm. One of the small differences is that the buffers are passed by the pointer, not the reference. Besides, there is the __global modifier, which indicates that the timeseries buffers are in the global memory. All OpenCL buffers we are to create are located in the global memory. We will use it to search for patterns and locating orders in a specially designated buffer. Where zero is a measurement index. To obtain the order serial number, use the atomic_inc() atomic function. When executing a task, we have no idea what tasks and bars have already been completed. These are parallel computations, and there is absolutely no sequence in anything here. A task index is not related to the number of already completed tasks. Consequently, we do not know how many orders are already placed in the buffer. If we try to read their number located in cell 0 of the Count  buffer, another task may write something there at the same time. To avoid that, we use atomic functions. In our case, the atomic_inc() function disables access of other tasks to the Count cell. After that, it increases its value by one, while the previous value is returned as a result. Of course, this slows down the work, since other tasks have to wait till access to Count is blocked. But in some cases (like ours), there is simply no other solution. After all the tasks have been completed, we get the formed Order buffer of orders and their number in the Count cell. Here we have two-dimensional task space. The 0 space dimension is equal to the number of placed orders, while dimension of the space 1 is equal to the number of bars of M1 period. When the open time of an order bar and M1 bar coincide, the operation of the current order is copied to the OrderM1 buffer and the detected bar index in the timeseries of M1 period is set. There are two things here that should not exist at first glance. The first one is the atomic_inc() atomic function, which for some reason counts the entry points found on M1 period. In the dimension 0, each order works with its index, while there can be no more than one match in the index 1. This means the shared access attempt is completely out of question. Why then do we need to count? The second one is the shift argument added to the current period bar time. There are special reasons for this. The world is not perfect. The presence of a bar on M5 chart with the open time of 01:00:00 does not mean that a bar with the same open time is present on M1 chart. If after the completion of the kernel operation, the number of found M1 orders is equal to the number of orders detected on the current timeframe, then the task has been completed in full. Otherwise, a restart with another shift argument is required. There may be as many restarts as the number of M1 periods contained in the current period. The task for the kernel is one-dimensional, and its size is equal to the number of orders. The kernel is to iterate over the bars starting with the position open one and check the conditions described above. Inside the bar, the ticks are simulated in the "1 minute OHLC" mode described in the "Testing Trading Strategies" section of the documentation. The important thing is that some positions are closed almost immediately after opening, some are closed later, while others are closed by timeout or when the test ends. This means that the task execution time for different entry points differs significantly. The real practice has shown that accompanying a position before closing in one pass is not efficient. In contrast, dividing the test space (the number of bars before the forced closure by position holding timeout) into several parts and performing the handling in several passes yield significantly better results in terms of performance. The tasks that are not completed on the current pass are postponed till the next one. Thus, the size of the task space is decreased with each pass. But to implement this, you need to use another buffer to store task indices. Each task is an index of an entry point in the order buffer. At the time of the first launch, the contents of the task buffer fully corresponds to the orders buffer. During the next launches, it will contain indices of the orders, positions for which have not yet been closed. In order to work with the task buffer and store the tasks for the next run there simultaneously, it should have two banks: one bank is used during the current launch, while another one is used to form tasks for the next one. In actual work, this looks like this. Suppose that we have 1000 entry points, for which we need to get trade results. The holding time of an open position is equivalent to 800 bars. We decided to break the test into 4 passes. Graphically, it looks as displayed on Fig. 7. By trial and error, we have determined the optimal number of passes equal to 8 for a position holding timeout of 12 hours (or 720 minute bars). This is the default value. It varies for different timeout values and OpenCL devices. Thorough selection is recommended for maximum performance. Thus, the Tasks buffer and the index of the task bank we work with are added to the kernel arguments apart from the timeseries. Besides, we add the Res buffer to save the results. The amount of actual data in the task buffer is returned via the Left buffer, which has a size of the two elements — for each of the banks, respectively. Since the test is performed in parts, the values of the start and end bars for position tracking should be passed among the kernel arguments. This is a relative value that is summed up with the position opening bar index to get the absolute index of the current bar in the timeseries. Also, the maximum allowable bar index in the timeseries should be passed to the kernel so as not to exceed the buffers. The tester_step() kernel works in one dimension. The size of the dimension tasks changes at each call starting with the number of orders decreasing with each pass. The open position is then handled. Let's consider this using the BUY operation as an example (the case is similar for SELL). After handling all the passes, the Res buffer stores the results of all trades. To obtain the test result, they should be summed up. Now that the algorithm is clear and the kernels are ready, we should start launching them. At the entry, it has a date range, in which it is necessary to test the strategy, as well as the links to the structure of parameters and test results. If successful, the method returns "true" and writes results to the 'result' argument. If an error has occurred during the execution, the method returns 'false'. To receive error details, call GetLastErrorExt(). First, upload timeseries data. Then initialize OpenCL. This includes creating objects and kernels. If all is well, call the test() method containing the entire test algorithm. In fact, the Test() method is a wrapper for test(). This is done to make sure that deinitialization is performed at any exit from the 'test' method and timeseries buffers are released. This is done using the LoadTimeseriesOCL() method discussed above. The order buffer has a size twice the number of bars on the current timeframe. Since we do not know how many patterns will be found, we assume that the pattern will be found on each bar. This precaution may seem absurd at first glance given the patterns we are working with at the moment. Further on, when adding other patterns, this may save you from many issues. It should be noted that exiting the Execute() method does not mean that the program is executed. It may still be executed or queued for execution. To find out its current status, use the CLExecutionStatus() function. If we need to wait for the program completion, we can survey its status periodically or read the buffer the program places the results to. In the second case, waiting for the program completion occurs in the BufferRead() buffer reading method. Now at the index 0 of the count buffer, we can find the number of detected patterns or the number of orders located in the corresponding buffer. The next step is to find the corresponding entry points on M1 timeframe. The order_to_M1() kernel accumulates the detected quantity into the same count buffer, although at index 1. Triggering of the (count==count) condition is considered successful. Next, check if the specified number of kernel execution passes is valid. By default, it is equal to 8, but in order to define the optimal performance for various OpenCL devices, it is allowed to set other values using the SetTesterPasses() method. Let's write a short script allowing us to launch our tester. 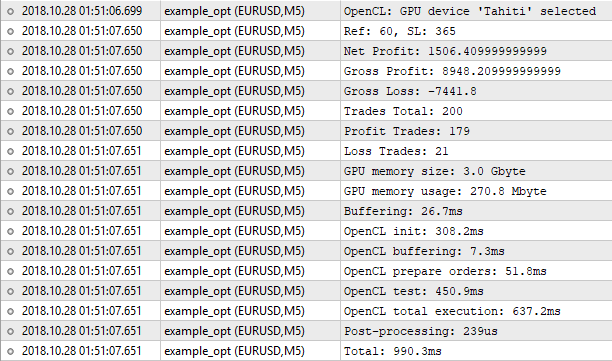 The applied test time range, symbol and period are the ones we already used to test the EA implemented in MQL5. The applied reference and Stop Loss level values are the ones found during the optimization. Now we only have to run the script and compare the obtained result with the built-in tester's one. Thus, the number of trades is the same, while the net profit value is not. The built-in tester shows the number of 1000.50, while our tester yields 1007.99. The reason for this is as follows. To achieve the same results, we need to consider a swap among other things. But implementing it into our tester is not justified. For a rough estimate, where the "1 minute OHLC" mode is applied, such trifles can be neglected. The important thing is that the result is very close, which means our algorithm works correctly. Now let's have a look at the program execution statistics. Only 16 MB of memory was used. OpenCL initialization took the most time. The entire process took 376 milliseconds, which is almost similar to the built-in tester. It is pointless to expect some gain in performance here. With 200 trades, we will spend more time on preparatory operations, like initialization, copying buffers and so on. To feel the difference, we need hundreds of times more orders for testing. It is time to move on to optimization. The optimization algorithm is to be similar to the single test algorithm with one fundamental difference. While in the tester we search for patterns and then count the trade results, here the sequence of actions is different. First, we count the trade results and start searching patterns afterwards. The reason is that we have two optimized parameters. The first one is a reference value for finding the patterns. The second one is a Stop Loss level participating in the trade result calculation. Thus, one of them affects the number of entry points, while the second one has influence over trade results and open position tracking duration. If we keep the same sequence of actions as in the single test algorithm, we will not avoid a re-test of the same entry points causing a huge loss of time, since the pin bar with a "tail" of 300 points is found at any reference value equal or less than this value. In addition, the number of tasks for searching patterns is multiplied by the number of reference variable values, while the number of tasks for calculating the trade results is multiplied by the number of Stop Loss level values. where Depth is a size of timeseries buffers, while SL_count is a number of Stop Loss values. However, there is one important difference — finding the maximum index of M1 timeseries. Let me explain why this is done. When testing a single pass, we deal with a relatively small number of orders. The number of tasks equal to the number of orders multiplied by the size of buffers of M1 timeseries is also relatively small. If we consider the data we performed the test on, these are 200 orders multiplied by 279 039 М1 bars ultimately providing 55.8 million tasks. In the current situation, the number of tasks will be much larger. For example, these are 279 039 M1 bars multiplied by 55 843 bars of the current period (M5), which equals to 15.6 billion tasks. It is also worth considering that you have to run this kernel again with a different time shift value. The enumeration method is too resource-intensive here. To resolve this issue, we still leave the enumeration, although we divide the current period bars handling range into several parts. Besides, we should limit the range of appropriate minute bars. However, since the calculated index value of the upper border of minute bars will in most cases exceed the actual one, we will return the maximum index of a minute bar after Count to start the next pass from this point. After preparing the orders, it is time to start receiving trade results. where sli is a value of the Stop Loss index contained in the order. The rest of the code is identical to the tester_step() kernel. After the execution, we obtain buy and sell results for each bar and each Stop Loss value in the Res buffer. Unlike testing, here we sum up the results of trades directly in the kernel, not in the MQL code. However, there is an unpleasant disadvantage — we have to convert the results into an integer type necessarily resulting in a loss of accuracy. Therefore, in the point argument, we should pass the _Point value divided by 100. The forced conversion of results into the 'int' type is due to the fact that atomic functions do not work with the 'double' type. atomic_add() is to be used for summing up the results. The Test buffer in the arguments is the results obtained after executing the tester_opt_step() kernel. The code of launching kernels from MQL5 during optimization is constructed similarly to the testing process. The Optimize() public method is a wrapper of the optimize() method where the order of preparing and launching kernels is implemented. We are not going to consider each string in detail. Let's focus only on differences instead, in particular, launching the tester_opt_prepare() kernel. Then, set the arguments and size of the task space. The offset of the 1 st dimension in the task space is increased after handling part of the bars. Its value is to be equal to the maximum value of М1 bar that is to return the kernel increased by 1. 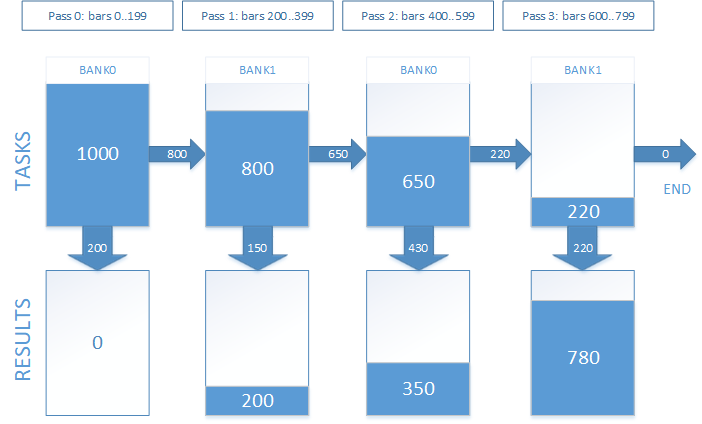 The m_prepare_passes parameter means the number of passes the orders preparation should be divided into. By default, its value is 64, although it can be changed using the SetPrepPasses() method. After reading the test results in the OptResults buffer, the search is performed for the combination of optimized parameters leading to a maximum net profit. After that, recalculate the results in 'double' and set the desired values of optimized parameters into the appropriate structure. Keep in mind that converting 'int' into 'double' and vice versa will surely affect the results making them differ slightly from the ones obtained during the single test. As we can see, the results do not coincide with the ones of the built-in tester. Why? Could the loss of accuracy when converting 'double' into 'int' and vice versa play a decisive role here? Theoretically, this could happen if the results differed in fractions after the decimal point. But the differences are significant. The result is very similar to ours. So, this is not the loss of accuracy. The genetic algorithm has skipped this combination of optimized parameters. Let's launch the built-in tester in the slow optimization mode with complete enumeration of parameters. As we can see, in case of a complete enumeration of parameters, the built-in tester finds the same desired values Ref = 60 and SL = 365, as the OpenCL tester. This means the optimization algorithm we have implemented works correctly. Now it is time to compare the performance of the built-in and OpenCL testers. 6 cores out of 8 are allocated for test agents. OpenCL tester is to be launched on AMD Radeon HD 7950 video 3Gb RAM and 800Mhz GPU frequency. The most important results for us are the values of the desired parameters, net profit, number of trades and optimization time. The obtained results show that the built-in tester often skips the best results in the fast optimization mode (genetic algorithm). Therefore, it is more fair to compare the performance relative to the OpenCL in the complete parameter enumeration mode. For more visibility, let's arrange a summary table of time spent on optimization. 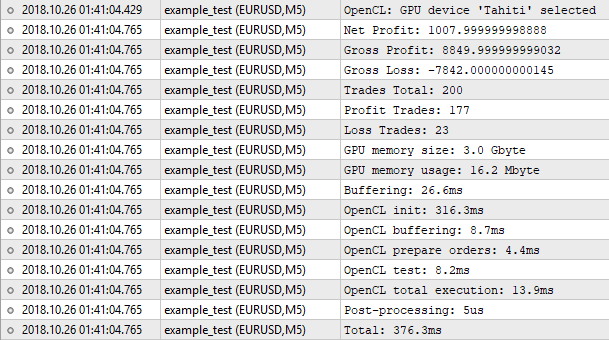 As we can see in the table, in some cases, the OpenCL tester is able to get results 2714 times faster than the built-in one. This is a good speed boost for those who value their time. Despite all this, the algorithm can greatly help when you need to quickly and roughly assess the performance of the simplest patterns, since it allows you to do so thousand times faster than the built-in tester running in the complete parameters enumeration mode and dozens of times faster than the tester using a genetic algorithm. The article describes the library allowing you to increase the efficiency of working with HTTP requests in MQL5. Execution of WebRequest in non-blocking mode is implemented in additional threads that use auxiliary charts and Expert Advisors, exchanging custom events and reading shared resources. The source codes are applied as well. This is the last article within the series devoted to the Reversing trading strategy. Here we will try to solve the problem, which caused the testing results instability in previous articles. We will also develop and test our own algorithm for manual trading in any market using the reversing strategy.